The Rhôd Artists Group were commissioned by PLATFORM to create a series of artworks primarily taking over noticebaords in the town centre… Kathryn Campbell Dodd “In Store” was made in partnership with Haverfordwest Town Museum, and features shots of the elaborate till which is housed in the museum and was the property of Sidney Davies Pugh (tobacconist and hairdresser) in High Street from the late Victorian era right through to and beyond WWI.The old photographs show shops and shop proprietors in the town and the current day shops which were photographed by Kathryn in October 2016 penny d jones “Hidden Trees “created an artful treasure hunt where the prizes were local trees and an experience of colour. Roger Lougher was a dancing fool describing Haverfordwest through movement creating two live Dance Performances over the three days. David Shepherd made images derived from site-specific activity at locations along the riverbank. Seán Vicary asked ‘Is your journey really necessary?’ as contemporary anxieties coalesce in the Pembrokeshire landscape. Liz Waterhouse invited you to ‘look through the spy-hole’. Jacob Whittaker connected with local pop culture: from DC to RCA, just how do you solve a problem like Bruce Wayne? A blog was created about the process of the artworks as they were developed and installed over the three days..
For Rhôd this was a great opportunity for us to work with a sister organisation and to help us build an audience in West Wales. It is lovely for us to be able to promote not just Rhôd but also the artists who give so much to making Rhôd happen. I was aided greatly by the availability of the noticeboards and the pre planning that made the whole event possible. Loved the brochure design and the fact it was on ISSUU as well – great. The Records Office is amazing – could that be used more often as an arts venue? I’ve really enjoyed working in Haverfordwest. I didn’t know the town all that well – but having photographed shop fronts all around the town, I now feel quite familiar with it. It’s beautiful – beautiful buildings. I understand much more about some of the problems the town faces and feel more confident to talk to colleagues and friends about The Lab and what it might achieve in the town. It was a step in my practice, to bring together colour and local trees with my first sound piece from a QR code. This piece moved on from my piece in Rhôd in Roath two weeks earlier. I found it exciting to make use/bring to life the dead corners in the centre of the town, of which there are many more and more potential. 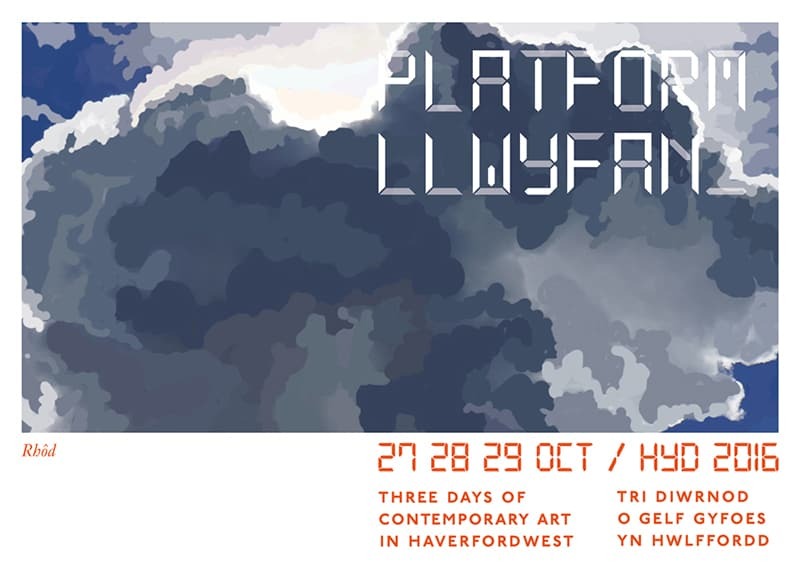 Rhôd is an artist-run project based in Drefelin Carmarthenshire.The emphasis of Rhôd is the creation of site-specific artworks including sculpture, installation, performance, sonic art and video alongside symposia, talks and presentations. Rhôd artists have been part of projects including Rhodio at the Venice Biennale in 2010, The Tannery residency in Machynlleth in 2012 and Made in Roath festival from 2013 to 2016.